One of the fastest growing card games around is 2-7 Lowball. This game has become more and more prominent in the mixed rotations in live high-stakes card games and has recently been introduced online. 2-7 Lowball is a Draw game in which the object is to make the worst poker hand possible. In 2-7 the deuce is low and the ace is high. Also, straights and flushes count against a player, therefore the best hand is not 2-3-4-5-6; rather it is 2-3-4-5-7. There are four possible “sevens” a player can make, and they are labeled #1, 2, 3, and 4. Number 1 is the nut 7 mentioned above, #2 is 2-3-4-6-7, #3 is 2-3-5-6-7 and #4 is 2-4-5-6-7. As you can see, the strength of the hand is determined downward, working from the highest card first. Therefore 4-5-6-8-9 would beat 2-3-4-5-T. When both players end with pairs, the lower pair wins, when both players end with the same pair, the lower kicker wins. Once again, if a player has a hand of the same suit, it cannot be used as a low hand. There are two types of 2-7 lowball, single draw and triple draw. 2-7 Single Draw – Single draw is typically played as either a No-Limit or Pot-Limit game. Because of the restrictions of cards in the deck, tables typically max at 7 players. Each player will be dealt five cards, face down. As in other draw games there is a dealer button, Small Blind and Big Blind. Action starts from the player left of the Big Blind. 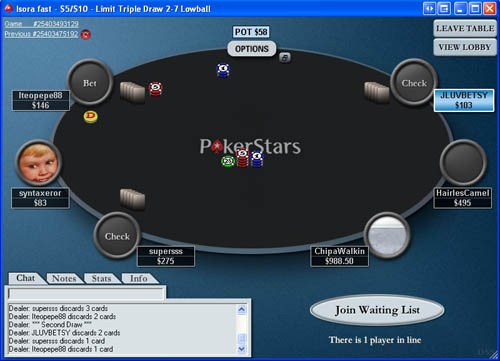 Players will fold, call, or raise during the first betting round. Once the betting round is over, players will then draw anywhere from zero (known as “standing pat”) to five cards, attempting to make the best (or worst) hand. Once all players have drawn cards, the first player to the left of the dealer button will act first. They have the option to check or bet, and all subsequent players will then have the options to check/call/bet/raise/fold. After this “single” betting round is completed, players will show their hands and the best low-hand will win the pot. 2-7 Triple Draw – The second form of 2-7 is triple draw. 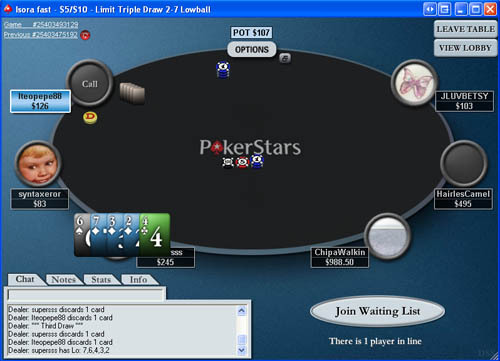 This game is more popular in a limit format; however, it is still played as a pot-limit or no-limit game from time to time. Because of the numerous cards being drawn, this game is typically played with a maximum of six players. Also, if the deck were to run out of cards, the remaining discarded cards will be shuffled and play will continue. The object of the game is the same as single draw; however, instead of having just one draw, there are three drawing rounds. This makes for four betting rounds, one pre-draw, and one after each subsequent drawing round. Just as in single draw players can draw anywhere from zero to five cards. Players wishing to “stand pat” after the first or second draw can still draw cards in later drawing rounds if they deem necessary, otherwise they can just stay pat in future rounds. In limit formats of the game the first two betting rounds work in increments of the Big Blind, and in the final two rounds the betting rounds work in increments of 2X the Big Blind (also known as a Big Bet). In each betting round the maximum number of bets that each player can make is four. When the fourth bet is placed the pot is deemed to be “capped” meaning players can no longer raise during this round. Therefore, the maximum amount of money a player can lose in any given pot is 24 Big Blinds or 12 Big Bets. You can find 2-7 Lowball games on PokerStars!